The idea behind Fatalni Zacini (Fatal Spices) came from two friends, Milan Babic and Aleksandar Velimirovic. Their friendship dates back to their childhood and they are now both in their fifties. They both had plenty of ideas, Milan also had plenty of land, whereas Aleksandar had some money he could invest and they therefore started growing exotic chili pepper varieties and tomato on around 0.25 hectares in the village of Vukicevica, 20 kilometers upstream from Obrenovac. Today, around fifty exotic varieties of bell peppers and chili peppers and several tomato varieties, as well as smaller amounts of spice herbs, which are processed into sauces and powders or are pickled, are grown in Vukicevica. Fatalni Zacini got the name from the Fatalii chili pepper cultivar. – I prefer the idea that it comes from the French “femme fatale”. As any woman can be fatal, so can every spice, if prepared and processed in the right way – Aleksandar Velimirovic says for eKapija. He adds that the advantage of Fatalni Zacini compared to industrial food processing is that everything is done on the spot, within a 100-m radius from where the plants grow. – Our tomatoes are picked only when they are fully ripe and when they have all the aromas a true tomato should have. Another big advantage compared to industrial cultivation is that we use the so-called EM technology from the start. It was designed by the Japanese and updated by the Russians. A cocktail of microorganisms speeds up the process of decomposition of the biomass that is used as a fertilizer five to six times, and the amounts of nitrogen, carbon and other parameters can be calibrated with great precision – our interviewee explains. In addition to being fully natural, the technology has several side effects which allow one to get more with less work. The usual soil working activities are not required, the soil becomes looser and grows in quality, and the fruit and vegetables become tastier. – So, our plants are picked ripe, at the most favorable moment, and then processed with select additional ingredients with the minimum of heat and packed without additives and preservatives. The final product, of course, is of top quality, as confirmed on several occasions by our current and future friends and partners. Each goal achieved is only a step towards the next one, and our current goal is to find a way to increase the volume of production without sacrificing the quality. The annual production of sauces and spices ranges from several dozen to several thousand jars or bottles. 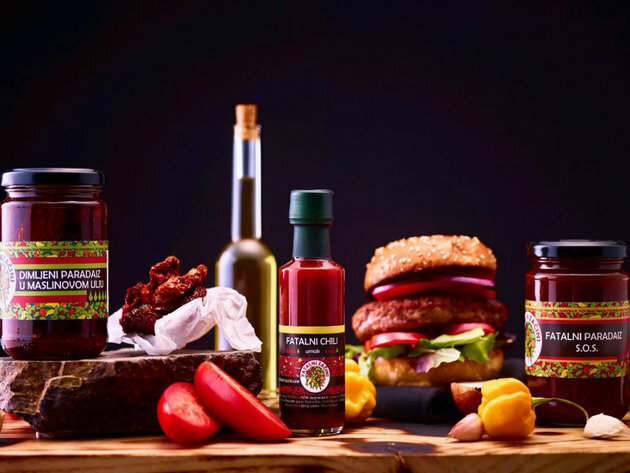 As our interviewee says, their chili sauce, the “scorpion” sauce, the tomato sauce, their dried and smoked tomato in extra virgin oil and their dried and smoked cayenne pepper have had the most success in the market. They plan to get subcontractors for tomatoes and bell peppers this year. Other ingredients are produced by themselves, except for the virgin oil, which is imported from Istria. Our interviewee does note that the expenses are too big and that the ratio of sales and production is insufficient for the maintenance of the entire process (from seed to jar), so they need to buy new equipment in order to increase the production. – The profit could be decent if there were, for example, 50 to 60 thousand units a year. This requires an increase in the production of vegetables with the help of subcontractors, in order to secure larger amounts of finished products. What follows is the procurement of additional equipment necessary for a more efficient production and processing, and a drying plant is currently are biggest and most important investment. They don't have any permanent employees and they hire 10-15 each year for the jobs of crop preparation, sowing, feeding, harvesting, processing and production.